Media is powerful. Media can influence people to think, act, and react in very specific ways. In the online world this becomes a dangerous game of rigging the system. Content publishers aren’t posting media to get the word out in a balanced and informative way. In this day and age of 24 hour news, publishers want clicks, shares, and comments. The more they get, the more secure their jobs. It’s now a luxury for a reporter to write a story about an obscure but important topic. That used to be a job requirement. Now it’s a career risk…. …Two reporters from two different publications this month both told us the same thing: if you want to write a story on an interesting but obscure topic, you had better feed the beast by writing a second story about the iPad or Facebook or something else that delivers page views and good SEO. Think about that for a moment, how in the world can you ever trust a news source or know that the information you are getting is reliable, important, or accurate? Beyond the current state of journalism – is the current state of media ownership. 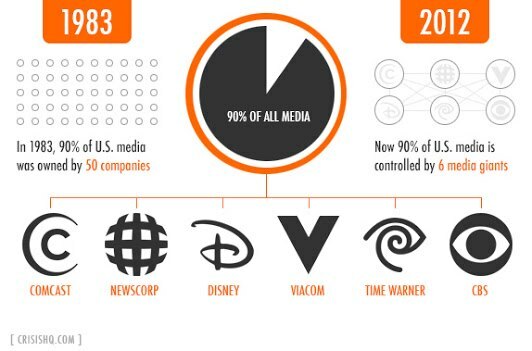 Less than 50 years ago you had 50 companies owning 90% of mainstream media – today a total of 6 companies own all of mainstream media. This is the case for much of the news you watch on a daily basis. The situation in Ferguson is a prime example. When the announcement was made not to indict the officer who shot and killed Michael Brown – people were indeed angry but many were expressing that anger in productive, non-violent protests. However, much of what was reported on the news were those few people who chose to express their anger in violent ways and that is what dominated your news feed. In this way the narrative was framed around the small amount of looting and rioting rather than the very real and honest issue of brutality and lack accountability by those in power. Never take anything at face value. Now that you know how easy it is to manipulate a narrative be willing to dig deeper to learn all sides of the story. Online search engines are your friend – use them to seek out many different reports on the same story. Pay attention to sources. Balanced reporting means seeking out and using a lot of different sources. A good news article will use these sources to tell an honest story and share those sources with the audience. Follow the trail to make sure information presented is coming from reliable places. Utilize sites dedicated to debunking fake stories. Snopes.com is a great example – they work tirelessly to bust myths and debunk all the fake news being generated online. Never share based on just a headline. Content publishers manipulate headlines – which are often hyperbolic nonsense that gets you to click on their story. They are not interested in whether you actually read – so if you see a headline that seems so outrageous you just have to share – follow tips #1 – #3 first and make sure what you are sharing is real. Rely on sources not devoted to getting more clicks. Ebola and climate change are prime examples of topics that are manipulated to serve the agenda of the group building the narrative. Don’t rely on the news, rather seek out the experts in these fields – science, medical, and business journals and reports are non-biased and devoted to sharing real and actual information. Be critical, be skeptical, be a sleuth. Journalists are no longer allowed to do this job anymore so it’s up to you. Never believe what you read or see, rather take in everything with a critical eye and do the research to either debunk or prove the accuracy of the media you are consuming. The moral of the story is – assume that all of it is propaganda – I know that sounds paranoid but we live in a time where we MUST question everything. Be a truth seeker and choose to consume smart media, in this way we can force publishers and media outlets to get back to real, reliable reporting.